March is the time for M-A-D-N-E-S-S! 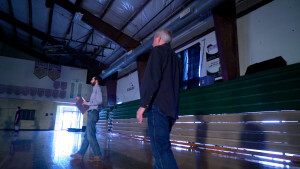 As the NCAA Tournament has begun for the year, we took the time to reflect on a very special basketball “hype” video we produced for a local high school basketball team in our area recently. The project took a lot of manpower and expertise to make this video epic. If you are a sports fan, chances are you have seen a pump up video for some athletic program that has their players in a well-lit athletic arena or gym. The idea is to accentuate these athletes in the most dramatic fashion, with close ups of faces, jerseys, any necessary objects, and oftentimes slow motion action shots the athletes would normally take in a game. The result of these shots together is a feeling that the team will “give it everything they got”, and they will come out victorious. This was probably the most extensive production shoot that All Star has been a part of to date. With the help of DHTV Digital, we prepped for a full day shoot that required a long pre-shoot set up time, multiple camera and lighting changes throughout the day, and a constant collaboration with the high school boys involved in the shoot. Our work was cut out for us. One of the most interesting things that we had to prepare for was covering all of the doors and windows in the gymnasium, in order to get the complete darkness necessary for a shoot like this. Some of the huge windows even had to be covered by a few of our large green screens. Throughout the shoot, we were able to capture many shots that absolutely showcased the team’s character. 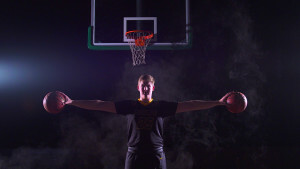 A few of the most notable shots were athletes dunking the ball up close, one athlete holding one basketball in each hand while both arms were stretched out, and to top the piece off, one shot of the senior class walking directly at the camera with fog at their back and their silhouettes standing out against the bright light behind them.